The Human Resource Club and the Student Human Resource Management Chapter at York held their end of the semester dinner award ceremony on May 12. 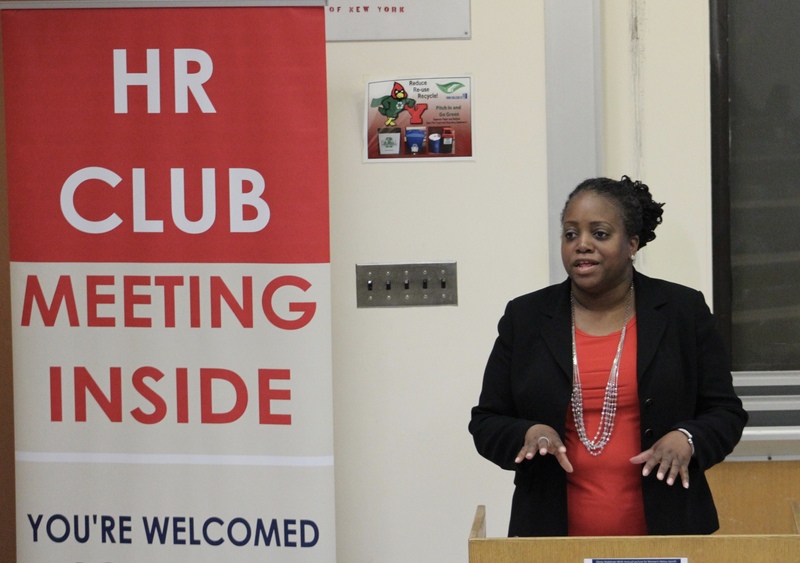 Carla A. Lyons, a York graduate, was the keynote speaker and elections were held for the new HR club and SHRM board officers. Provost Panayiotis Meleties attended the event along with Marcia Moxam Comrie, a communications specialist with the college. The event started with Meleties thanking the students and staff who attended the ceremony. He encouraged students to ask Lyons as many questions as possible. The faculty advisor for the clubs, Dr. Phoebe Massimino, then introduced Linda Ribaudo, the director of the Learning Center, and Janine Scott, the advisor for the Professional and Continuing Education Center. Massimino thanked the pair for their partnerships and the help these two centers have provided to the clubs. Massimino also introduced Lyons, who graduated from York in 2004 with a B.S. in Business Administration with a concentration on Human Resource Management. Lyons is an HR professional with 12 years experience. Lyons currently works at NYU Winthrop University Hospital as an executive assistant in the Research Administration. 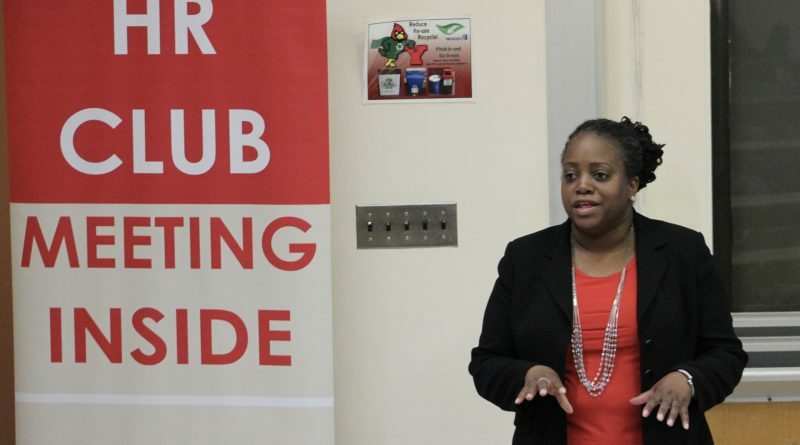 She is a member of Sigma Beta Delta, an honor society for Business Management and also an active member of the SHRM and the York College Alumni Association. “I have to tell you I met Carla about ten years ago, and she has continued to be one of the most conscientious, hard working and dedicated individuals I have ever met,” said Massimino. “She worked really hard and her grades showed it. I’m very proud of her. Lyons started her speech by telling students the HR field will require a lot from them especially in a healthcare environment. Throughout her speech, Lyons repeated that HR professionals will always have something to do. She said HR people have to pay attention to detail to make sure every document is accurate. Lyons also talked about what she does at her job. She allocates funds from grants and monitors the expenses, she has made multiple calendars and schedules, manages volunteers and places them according to their needs with a particular researcher and she also does contract and payroll processing. “If you are not willing to work outside their general job description you will not succeed,” Lyons warned the students. 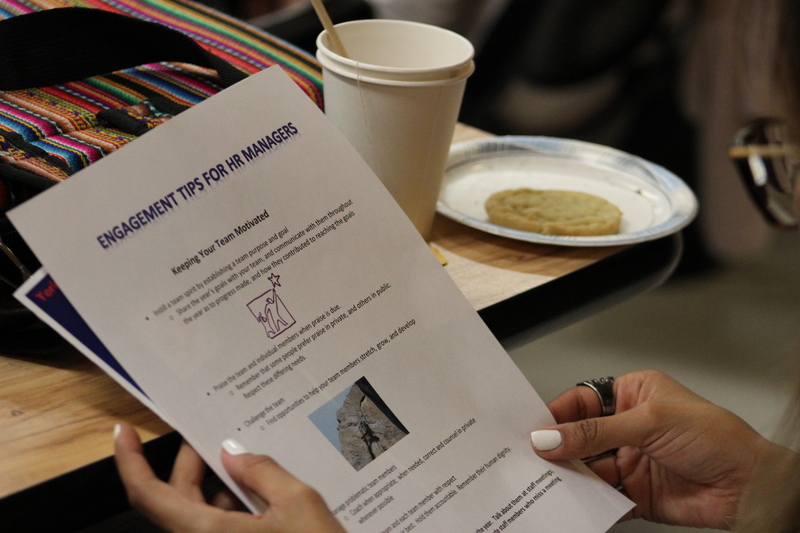 She brought handouts that had tips for HR managers that focused on how to keep the team motivated by sharing the goals of the team, by praising members individually or when appropriate, by challenging the members, coaching problematic members and treating them with respect. 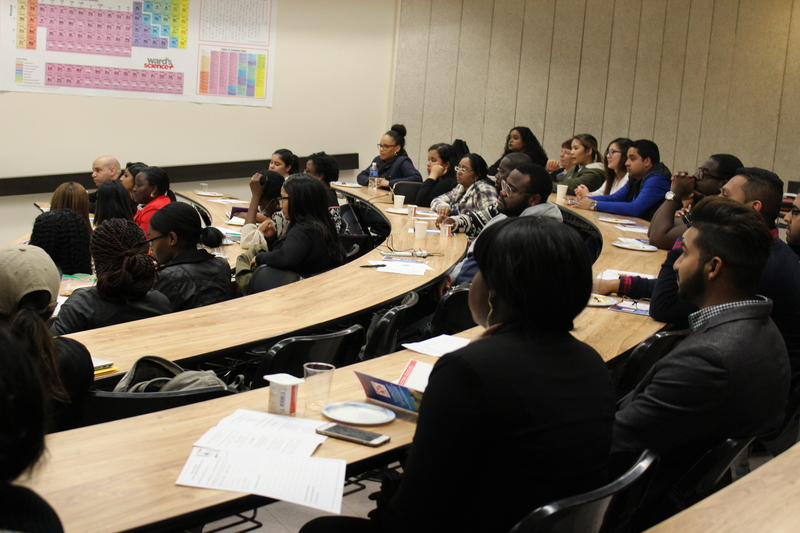 She told students that they need to stay informed with the SHRM website and to take the Senior Certified Professional and the Certified Professional exams which are certifications that are managed through the SHRM. After she concluded her presentation, a Q&A took place. The first question she was asked was, which areas of her job are the hardest. She said the hardest area is to choose the right candidates. She discussed an interview she had previously conducted. During the interview Lyons informed the candidate that there are times of the year where she would not be able to leave at 5 p.m. because there are so many tasks to get done. The candidate responded by saying she would do everything she could and then leave. Her response made Lyons take the woman’s application and put it on the ‘will not call’ file. Lyons remembered being asked by different employers if she were to select a fruit what would it be, and the same for an animal. The audience asked her which fruit she selected and she replied an apple. She was also asked how can an HR graduate get support for career progression. She responded that a Bachelor’s degree is not going to give recent graduates an entry level job. According to Lyons, a higher level degree is exceptional for pursuing a career in HR. Lyons received a gift and a certificate on behalf of the HR club and then Dr. Massimino started to give the awards. The Human Resource Club Officer awards were given to the HR club president, Tiffany Singh; HR club vice president, Tesha Deonarine; HR club treasurer, Lindsay DeWalt and HR club secretary, Amanda Baksh. The Society of Human Resource Management Officer awards were given to the SHRM president, Tabitha Bountsebe; the SHRM vice president, Lindsay DeWalt; the SHRM treasurer, Jonathan Diaz and the SHRM secretary, Peony Chan. The Certificate of Appreciation awards were given to people who have worked with the HR club, but they are not members of the club. The awardees were Marcia Moxam Comrie; Student Activities Administration and Staff, Dr. Jean Phelps and Mr. Anthony Andrews; Vice President for Student Development, Dr. Vincent Banrey; Career Services staff, Linda Chesney and Sara Garcia; Assistant for Campus Planning, Sherrian Grant-Fordham; Food Service Director, Henry McCants; and Ismael Perez and Claudette Small Robinson from Administrative Affairs. Partnership awards were given to Dominique Ambroise and Linda Ribaudo from the Learning Center, Oslene Carrington, the Executive Director for Economic and Workforce Development, and Janett Hunter, Teresa Reyes, and Janine Scott from the Adult and Continuing Education Center. The Human Resource Club awards for Membership and Participation were awarded to people who show up, set up meetings and clean afterwards. The awardees were HR club members: Amanda Baksh, Tiffany Singh, Samuel Williams Jr., Peony Chan, Lindsay DeWalt, Jonathan Diaz, Robin Gurdon, Glaelle Mathurin, Regine Michel, Johnson Oye and Sadat Rahman. 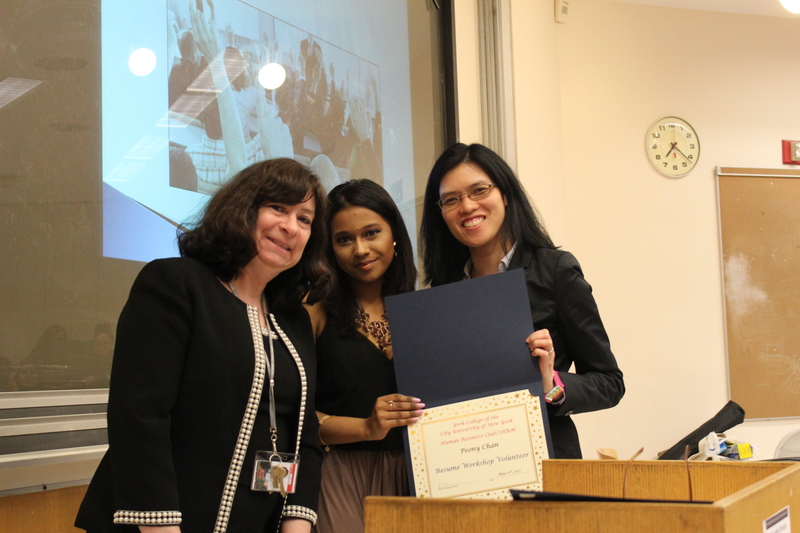 The Volunteers for Resume Workshops awards were awarded to faculty and HR club members who volunteered and did not receive extra credit at the resume workshops provided by the HR club. The awardees were: Amanda Baksh, Tesha Deonarine, Peony Chan, Adjunct for the Business and Economics Department Sheridan Abraham, Jonathan Diaz, new SHRM members Brian Lin and Amerita Habib, Denise Uriri-Luke, Tiffany Singh, Adjunct for the Economics and Business Department Minerva Dolezalek, Robin Gurdon, Glaelle Mathurin, Advisor from Academic Affairs Veronica Novy, Johnson Oye and Sherry Shivprasad. At last, the elections for the HR and SHRM positions were held. Amerita Habib became the President of the HR club; Glaelle Mathurin, the Vice President; Sherry Shivprasad, the Secretary and Peony Chan, the Treasurer. For the SHRM, Susan Pride became President of SHRM; Tabitha Bountsebe, the Vice President; Amerita Habib, the Secretary and Brian Lin, the Treasurer.